Adding a 4 channel amp is a great idea. I’ve enjoyed powerful, crystal-clear sound in my vehicles for years using my own 4 channel amps. But how do you hook them up? In this guide I’ll show you how to hook up a 4 channel amp to front and rear speakers. After installing hundreds of amps in vehicles just like yours I’ll share with you the fundamental tips you need for great results. And hey – don’t worry…in most cases you can do it yourself and get professional results on a budget! 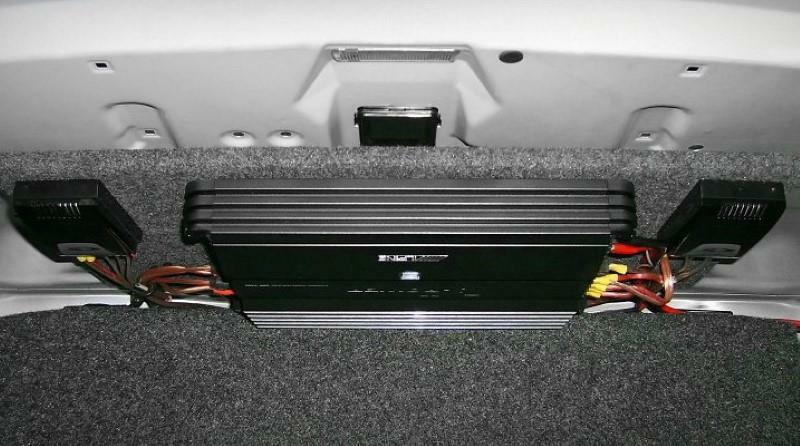 If you’re reading this there’s a good chance you’re not familiar with installing an amp, connecting wiring, and other details related to hooking up a 4 channel amp in a vehicle. Not everyone has installed car stereo equipment before so I’m going to be as thorough as possible and avoid making any assumptions about how much you know. Today’s 4 channel amps offer newer technology, better sound, and more compact size than in the old days. An excellent example is the Alpine MRV-F300 50W x 4 model. It uses Class D technology to run extremely cool and yet it’s small enough to fit under a car or truck seat. Very nice! 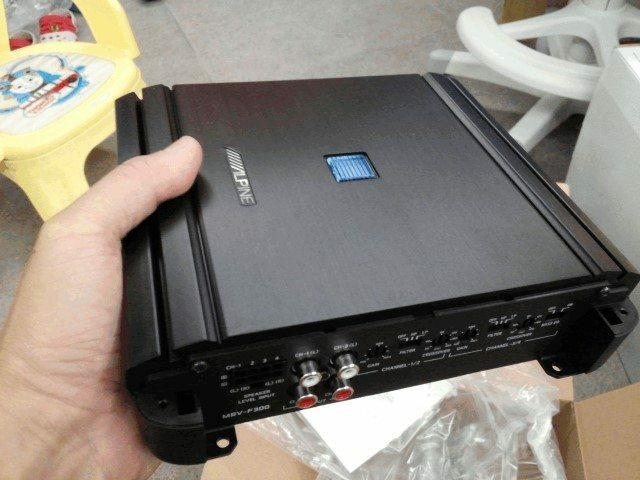 What a 4 channel car amplifier is may seem obvious at first but there’s a bit more to know Additionally, there are some interesting (and good) ways they differ from 2-channel amps. In fact, there are actually a few benefits you’ll get using one 4 channel amp instead of 2 stereo ones to power your front and rear speakers. A 4 channel amplifier is a stereo amplifier with 2 more channels built in to boost (amplify) weak input signals to a higher voltage signal. This drives speaker voice coils to move the speaker cone and produce sound. 4 channel amplifiers add more channels into a more compact and efficient design than separate amplifiers would have. Additionally, they offer more flexibility, as most can be configured for “bridged” operation which can gives more power when you don’t need all 4 channels. What is “bridging” an amp? Bridged mode capability is a special design feature in which a “push-pull” set up is created: one channel (normally used for the left speaker) produces a signal that’s the opposite of the second channel (normally used for the right speaker). This causes the speaker to receive a voltage audio waveform that is the difference of the two channels – resulting in more available power to speakers. Essentially, bridged mode is a flexible way to get more power if you’re not driving 4 speakers. 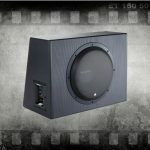 It means 2 channels are sharing the workload of one speaker between them and therefore and drive it with more power. A 4 channel car amp is basically an expanded version of a 2-channel amp. However, because they’re built together and not 2 separate 2-channel amps, they’re more compact. This saves installation space and makes it easier too. Additionally, most can be bridged to use 2 channels (or 3, depending on your needs) so you’re not restricted to using them with only 4 speakers. Whether you have a factory stereo or a great aftermarket (non-factory) one, adding an amplifier is one of the best decisions you can make. In-dash stereos are very limited in how much power they can produce. They can’tt drive speakers with the same clarity and low distortion like a good amplifier can. The maximum volume you’ll be able to get from your speakers will be pretty low, too. There’s simply no way around it – most in-dash stereos are limited to about 15W-18W RMS of power for each speaker channel. That’s because they’re running directly from the +12V supply. Amplifiers are unique in that they take the +12V electrical supply and boost it to a higher voltage. When a signal is boosted and sent out to your car’s speakers the voltage is much higher and the speaker can receive much more power. That’s why tiny amplifiers are rarely worth bothering with – if there’s no special power supply inside, it’s simply not capable of producing much power. Powering speakers from an amp makes a big difference, and I’ve enjoyed excellent sound for years this way. When an amplifier drives your vehicle’s speakers it’s often not even pushed to its limits. The sound produced at the speaker has lower distortion, doesn’t “bottom out” when heavy bass is played, and you can get a lot more volume, too! Additionally, using an amplifier with built-in high-pass crossovers means you can block out lower-end bass that causes your speakers to distort and attempt to play music tones they’re not suited for. The result is cleaner sound, less distortion, and great volume – you can crank your music even higher! Just imagine driving down the road with the windows open and finally being able to blast the music you love. I’m confident you’ll love it as much as I do. It only takes a few minutes to make a list of the parts, wire, tools, and other bits and pieces you’ll need. 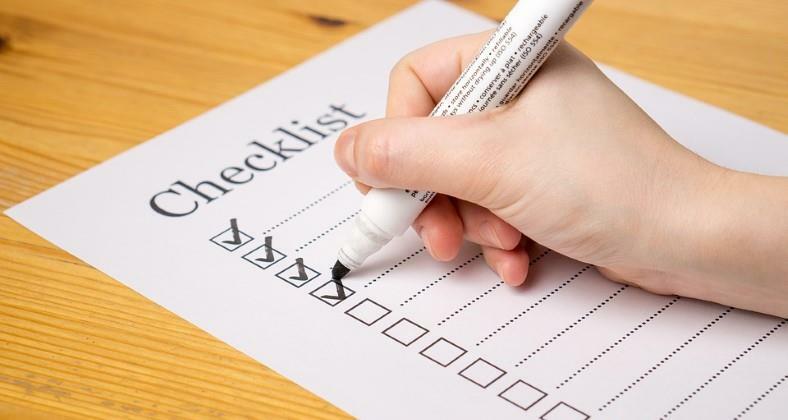 Planning ahead can mean the difference between getting your system going without major problems or having a frustrating time – or complete failure! I always get organized and get my items together before I start a job. Planning ahead is very important. You don’t want to run out of wire or discover you don’t have the rights parts, for example. That will mean you can’t finish your project. It’s even worse when you have to drive around town searching for items or you’re not able to do anything after the stores close. Believe me, I’ve been there, and it’s terrible! When it comes to installations, always plan to have more, rather than not enough, wire. This goes for speaker wire as well as RCA cables. The amplifier kits I recommend have the right length for your amp installation, but speaker wire & RCA cables are another matter in this case. What length and size speaker wire do I need? There’s no need to spend an excessive amount of money on speaker wire. 18 gauge is enough for many installations, but 16 gauge is a great choice too, if the price is right. A great example is this AmazonBasics 100 foot roll. I recommend a 100 foot roll for many installations with a 4 channel amp (see why below). Let’s use roughly a 15′ length of distance from the radio to the amp. That’s a good estimate in my experience. Total estimated wire required: 120 feet. That means you need 2 100 ft rolls of wire. Or at the least, 1 100 ft roll and 1 50 ft roll. If you’re planning to use a line-level adapter, expect to pick up a 100′ roll. If your installation is using RCA jacks, expect a 100 ft roll also (4 channels x 15′ length estimate for the speaker wire from the amp). If you’re installing a 4 channel amplifier and using RCA cable connections, you’ll need to buy a 2nd pair along with your amp wiring kit, as most only include a 2-channel cable. For most installations I recommend 18′ length cables. That’s usually long enough for most vehicles and you should usually have enough length to hide the cables inside the interior and under the rear seat, etc. There’s no reason to spend an excessive amount of money. Just pick up some good quality, well made cables. Even a pair like these value-priced ones will be fine in most cases. 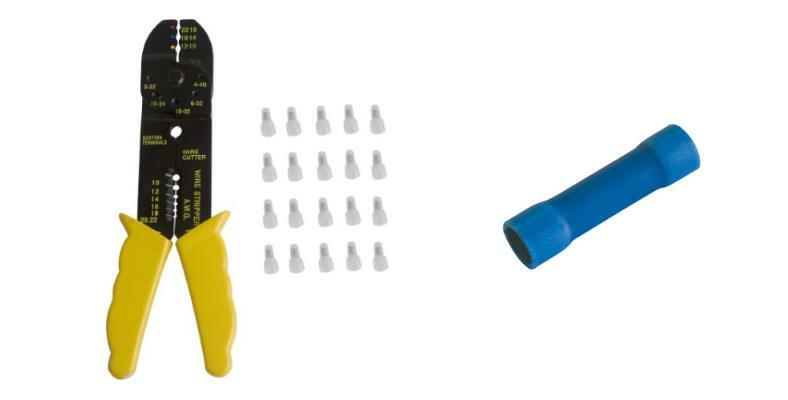 Crimp tools are great for installing your amp and speaker wiring with professional results. If you’re doing your own installation, you can get by with an inexpensive tool like this Pros'Kit crimp tool. Crimp connectors are sold separately in many automotive parts stores or general stores and are very affordable. I recommend a few tools. If you shop carefully, you can avoid getting ripped off on tool prices. When connecting speaker wiring to factory wiring, it’s easier to use crimp connectors than solder. Never simply twist wire together and wrap it in electrical tape. Always use a reliable connection. During warm weather electrical tape adhesive can fail and the tape can come off of wire. This exposes it to possible short circuits and potential damage to your radio or amp. If you have access to a cordless drill, that’s fantastic! They’re great for drilling holes in the vehicle’s metal for mounting your amplifier or connecting the ground wire to bare metal. A test meter is often incredibly helpful when installing an amplifier. However, you don’t need to spend much money! A basic but good budget model like this one at Amazon will work great. 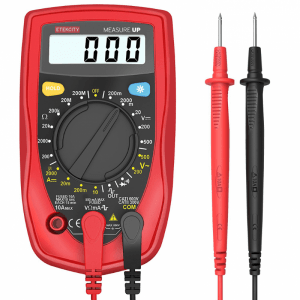 I recommend getting an affordable but good digital test meter to find a switched +12V wire for getting a remote-on signal to the amp. They’re also extremely helpful when troubleshooting power problems when something isn’t working. Here’s a general but pretty accurate list of what you’ll need for connecting a 4 channel amp to front and rear speakers. Be sure to plan well and estimate the amount of speaker wire you’ll need. For the amp installation itself I strongly recommend using a pre-made amp wiring kit like you’ll find here in my amp kit buyer’s guide. You’ll also need to get a 2nd pair of RCA cables. I recommend 18 ft length or more. Don’t spend too much money, but do get decent quality ones. Image of an aftermarket (non-factory) stereo showing the RCA jacks and speaker output wiring. Either one can be used for getting a signal to an amp, but RCA jacks offer a better option. They’re normally lower distortion and allow using plug-in RCA cables. If those aren’t available, either an amp with speaker-level inputs or a line level (speaker level) adapter can be used. In order to install a 4 channel amp and drive all 4 speakers, in many cases the biggest obstacle is getting a signal to the amp. Once that’s done, the rest is usually a standard amp installation. NOTE: I won’t be covering factory sound systems that are “premium” and have a factory amplifier. Those such as Bose, JBL, and Mark Levinson, often found in luxury vehicles or special-edition models, are much more complex and harder to deal with. In that case my advice is to speak with a good installation shop first and do your research. If you feel that factory amplified systems should be here as well, send me a message or comment and let me know. In a few cases adapters are available to connect an amp to a factory amplified system’s audio wiring, but it’s often difficult or there are obstacles you won’t find until you get started. One of the reasons why is that factory amplified systems often have non-standard wiring connections for the audio path and are prone to bad noise problems if you connect an amplifier without the proper adapter or wiring. Which type of connection do I need? If you have a radio with RCA jacks, skip on down to the next section. Line-level converters like this PAC LP7-4 4-channel model are designed to take speaker-outputs from a stereo with no RCA jacks and adapt them to RCA jacks. Using this, you can run RCA cables to your amplifier. Line level converters are designed to allow connecting to an amplifier’s RCA inputs by converting speaker outputs from a stereo to a low-level signal an amp can use. It’s very important to buy a quality, well-designed line-level adapter for avoid noise, poor sound quality, and other problems. Don’t get the cheapest – instead, get a name brand model you can rely one (like the one above). Amplifiers with high-level (speaker-level) inputs like this one allow connecting to speaker wiring for a signal source. This avoids having to buy a separate adapter. Speaker level inputs are common on many 4 channel amplifiers. These amps contain electronics that scale down speaker wiring signals to a lower signal safe for the amplifier’s input circuitry. 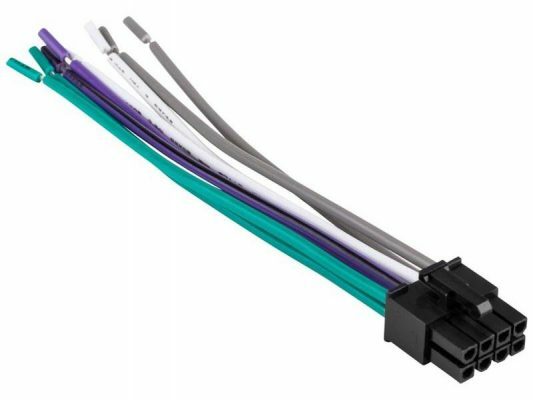 They’re simple to connect: normally it’s just a matter of connecting both positive (+) and negative (-) wiring for each speaker channel on a small wiring harness included. This then plugs into the speaker level input connector. A typical speaker-level input harness for a 4 channel amp. The wires are color coded to make installation easier. White = left front, gray = right front, green = left rear, and purple = right rear. While it can save money (you won’t need a line-level adapter in this case) I often recommend that people consider buying a line-level converter anyway. This allows an easier upgrade for your stereo later, which is very common for people to do. Using the line-level converter now will allow you to run RCA cables to your 4 channel amp to be used later if you buy a better stereo (which will include RCA jacks, almost always). RCA jacks offer a clean, lower-noise connection than speaker-level adapters do, but honestly it’s not noticeable to the average person. 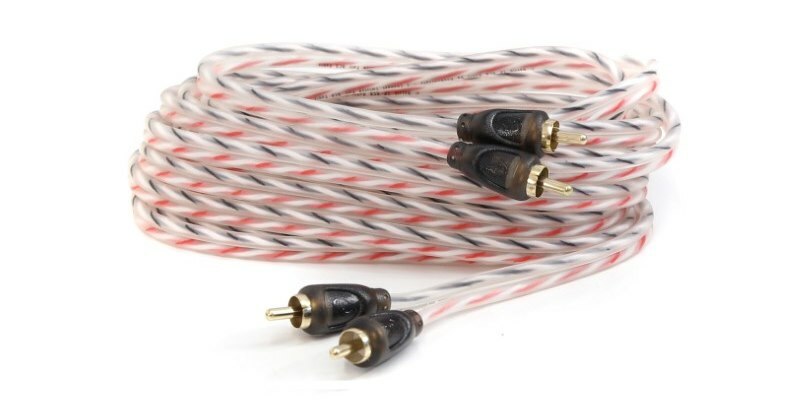 RCA cables (line-level connections) are the preferred way to connect a signal to your amp if you have that option. RCA jacks on the rear of a Pioneer head unit. This is the ideal way to connect your amplifier’s signal inputs, if available. For a 4 channel amplifier you’ll need 2 stereo RCA cables to do so. White represents the left channel white red represents the right. These are standard colors for audio outputs for both car and home stereo. If your stereo has RCA jacks, then congratulations. Things just got a bit easier – and potentially better sounding, too! You’ll need 2 stereo RCA male-to-male cables (4 audio channels total) to run from the radio to your 4 channel amp. That’s 4 signal channels: left & right front and left & right rear. You can also click here to view the .pdf document for print or download. As mentioned above and as shown in the diagrams, if you’re using speaker-level outputs to get a signal from the radio, you’ll need to connect wire. Ideally you’ll do so near close to the radio, then run the wire together as a bundle. You can bundle speaker wire together with wire ties to keep it neat and make the installation easier. Estimate the length of speaker wire you need to reach the amp (or line level converter) for each audio channel. To do so, run a length of wire from the radio to where the amp will be installed, then allow a little extra and enough length to run around curves and interior part. I recommend connecting to speaker-level outputs using crimp connectors and a crimp tool for a reliable, solid connection. Blue connectors are normally the right size for 18-16 gauge wire. If you have a factory stereo, you’ll need to find the wiring colors for find the speaker wiring. A great resource for that is The12Volt.com, where you’ll find wiring diagrams for your vehicle and color codes listed. After removing the radio you’ll find connectors like this for the factory stereo wiring harness. You’ll need to separate the speaker wires, cut them, and attach wiring to run to the amp. Remove the radio and disconnect the factory wiring plugs or aftermarket radio’s wiring harness. Cut the speaker wires, leaving enough length to move the wire and to have enough length to connect to the wire freely. 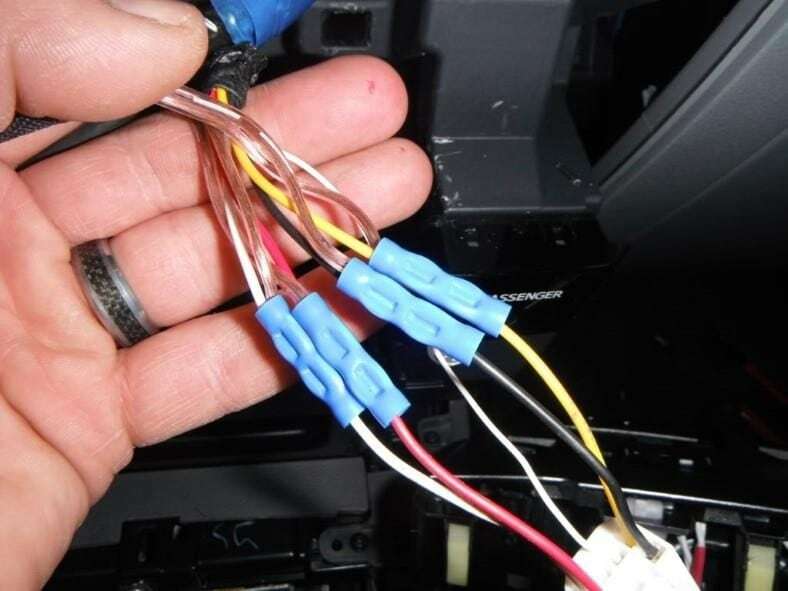 Strip a small part on both the stereo’s speaker wire and your amp speaker wiring. If using a line-level adapter, connect to the stereo’s speaker output side. Then connect the 4 pairs of wire to the speaker wiring in the harness. Insert the stripped wire (about 1/4″ of bare wire) into the connectors and crimp them carefully using a crimp tool if you have one. 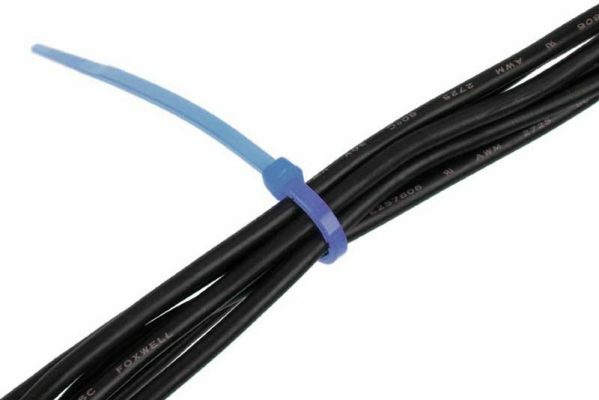 Alternately, you can twist together wire, solder it, and carefully wrap it with electrical tape or use heat shrink tubing for insulation. If using speaker level inputs on your amp, also connect 4 pairs of wire to the output of the stereo. To make a neater, more professional installation, bundle the speaker wiring similar to this using wire (“zip”) ties. I recommend using 6″ ties which often are sold in packs of 100. Once all wiring is connected, bundle it up using wire ties or, optionally, a little bit of electrical tape wrapped around. In both cases spacing out wire ties or tape about ever 1 or 1.5 along the length of the wire works well. Connecting RCA cables to an aftermarket (non-original) stereo for running to an amplifier. If you’re using a line-level converter or have a stereo with RCA jacks, connect all 4 cables plugs to the front and rear outputs. RCA cables are sometimes marked with left and right symbols (“L” and “R”). In some cases, white, clear, or some lighter color can be used to represent the left channel. Connect the cables consistently so you’ll be able to recognize which one is which. If the front and rear RCA cables are the same, you might want to mark front and rear using some masking tape and a marker or pen. Don’t forget the remote wire! 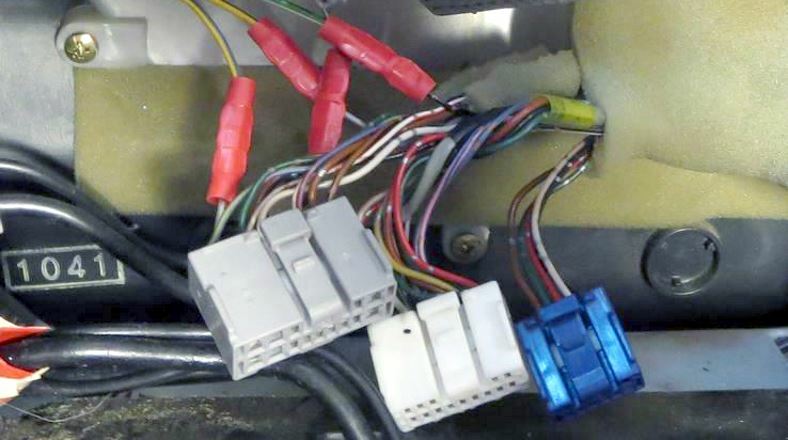 Amp wiring kits include a small wire that’s used to connect the amp so that it switches on and off with the accessory position of the ignition switch. Locate a +12V wire that has power when the ignition is switched to “ACC” or similar, but turns off with the key. You may also have good luck finding an existing wire color from vehicle wiring diagrams I mentioned earlier or from a Google search. I recommend checking the wiring even if you have already located it online, just to be sure. Before re-installing the radio connect this wire and run it along side the speaker wiring. You can connect a head unit car stereo with only 2 channels (left and right) to a 4 channel amp easily. Ordinarily all you need is 2 RCA Y adapter cables. The head unit’s left channel RCA jack should be connected to the left front and left rear amp inputs. Likewise for the right channel. 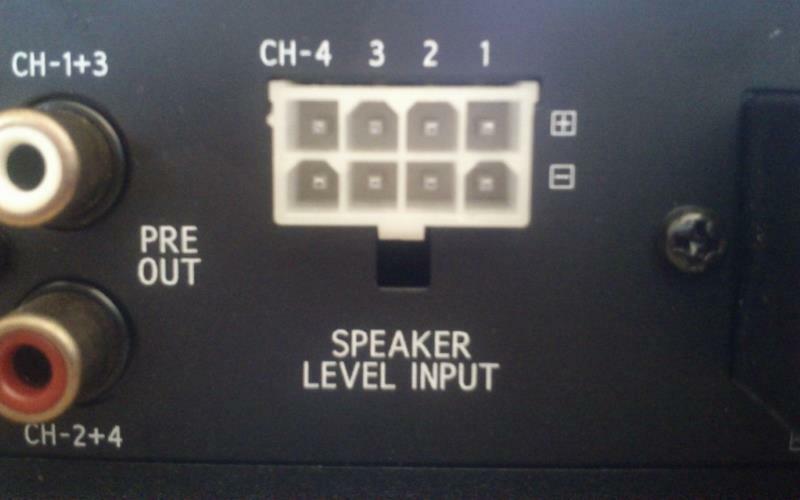 If using speaker level inputs on the amp, use the connections shown above. NOTE: Use only ONE of the two connections above! Never connect both types at the same time! Speaker-level outputs will damage RCA connections. If your head unit (car stereo) only has 2 RCA jacks or two pairs of speaker outputs, that’s not a problem. 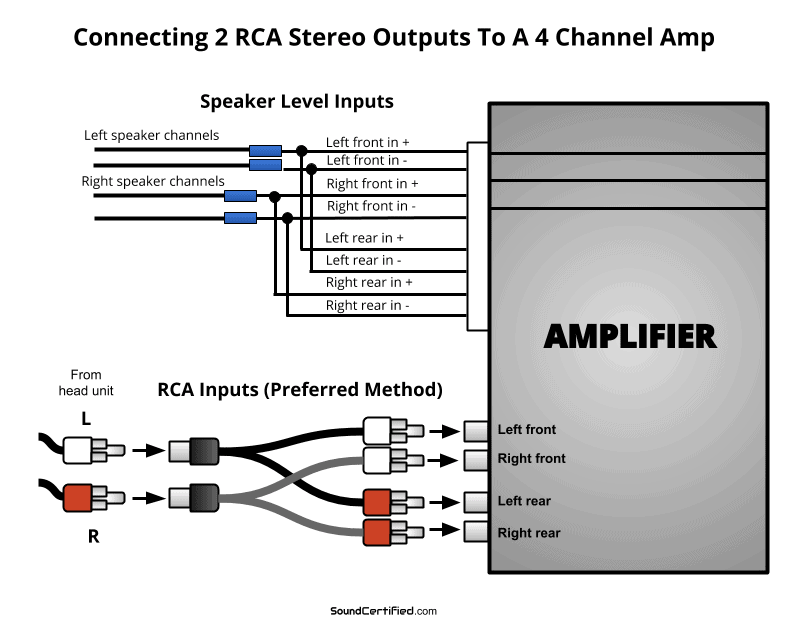 As shown in the above diagram, you can connect 2 channels to a 4 channel amp using either the speaker level inputs wired in parallel or by using simple RCA adapter cables. 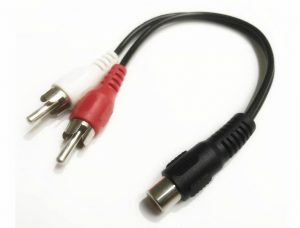 All you need is a decent pair (a total of 2) female to male RCA “Y” adapters like these low-cost ones from Amazon. The sound quality will be exactly the same. Today’s amps are designed in such a way that there’s no harm in using a Y adapter to connect the amp. The amplifier will receive exactly the same signal, with the same quality, in the front channels as well as the rear. The only drawback is there won’t be a front to rear fader control like with head units with 4 channels of outputs. 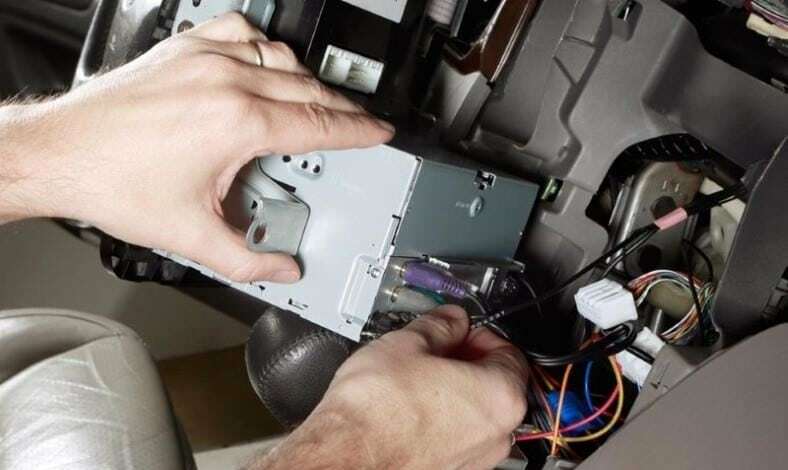 After connecting the stereo to the amp, you’ll need to adjust the rear gain to set the volume level for the rear speakers as needed for the proper volume depending on the stereo’s signal strength. An amp wiring kit like this one will make installing your 4 channel amp much easier. A good-quality one like this Belva 8-gauge complete kit includes not just wiring but much more. You’ll also need to pick up a 2nd pair of RCA cables (if using them) and enough speaker wire. Your amplifier needs a good solid metal connection to ground and you’ll need to run the positive battery wire to the engine compartment. Your amp wiring kit will also include a fuse holder that should be installed near the battery as well (most kits include instructions, by the way). You’ll also need to connect the amp’s speaker outputs to the wire you ran from the radio. Once installed, you should set up your amp’s gain levels and crossovers for best sound. In this image you can see the adjustable crossovers for both front and rear channels. Turn on the high-pass crossovers and adjust to a setting close to 50-60Hz, to allow good bass for music but block low-end bass that distorts. Gain control is the amount of signal amplification the amplifier performs. Ideally, with a good input signal it can be kept low to reduce any hiss or noise that can appear when it’s turned up high. When finished you should have enough volume available from the stereo but noise should be minimal. You’ll still need to tweak it a bit if volume is too high or too low. As I mentioned at the beginning of this guide, using high-pass crossovers will allow more volume with less distortion and will help protect the speakers from heavy bass. For both front and rear channels turn on the high-pass feature and, if an adjustable dial is available, set it near 50 to 60Hz. Some models don’t offer an adjustable frequency for the cutoff, but are likely preset to a good level. Once installed, test and tweak your amplifier as needed. A great way to mount your 4 channel amp is by using a board mounted to the car, covered with speaker box carpet or other material. Play some music you’re very familiar with and adjust things like bass, treble, and the fader as needed. Using music you’re very familiar with (of high quality) means you’ll be able to notice any problems with the sound fairly easily. If you don’t already have one, you might consider later upgrading to a head unit with built-in equalizer (EQ) functions to help tailor the sound. Hopefully you’ve found this post helpful. Hooking up a 4 channel amp to your front and rear speakers takes some work and time, but it’s a great way to get sound you’ll love. Considering buying an amplifier? You can find some great 4 channel amps (including the Alpine MRV-F300 pictured here) in my 4 channel amp buyer’s guide. 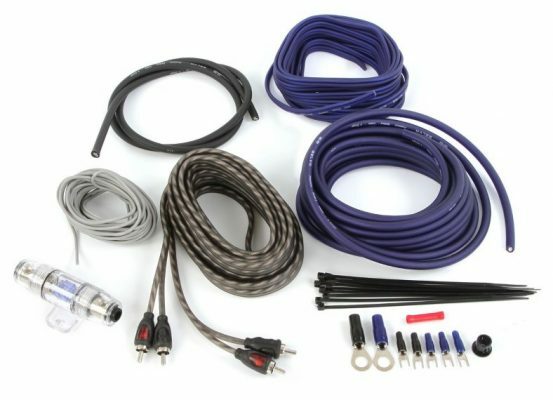 You’ll also need a good amp wiring kit – I’ve got a good amp kit buyer’s guide here. If you find anything missing or have suggestions, just leave a comment below or send me a message! Thanks for your great write up. I only have 1 pair of rca outputs on my HU. Can I just use 2 pairs of y splitters to send the RCA signal to 4 channels or will I lose some quality? Hi there, Taylor! I appreciate your comment and the question, too. It’s a good question! 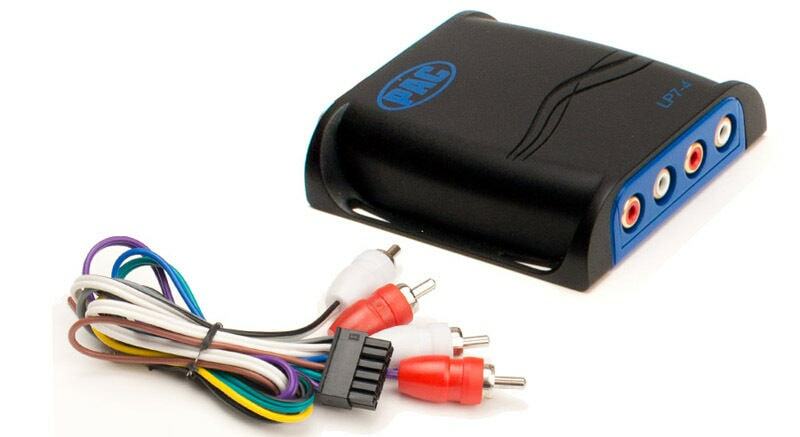 Yes, you can use 2 Y RCA cable adapters to send 2 RCA outputs from the head unit to 4 inputs on an amp. The amp is designed in a way that it won’t matter, and it won’t hurt anything. The signal quality should be basically exactly the same (unchanged) for all 4 inputs to the amp. You’ll just need to use the gain on channels 3 & 4 to set it like a fader when getting it set up. I would set the front pair first correctly and then worry about setting the rear channel levels. So going off what you’re saying it seems like you run your speaker wire out put from amp back to behind stereo and then connect the to the wire harness which then is using the stock factory speaker wire to feed the speakers in doors. Do you find any difference in avoiding the factory speaker wires to speakers? Meaning run new speaker wire from amp directly to each speaker. I was going to run with 16g this way, directly from amp to each speaker. 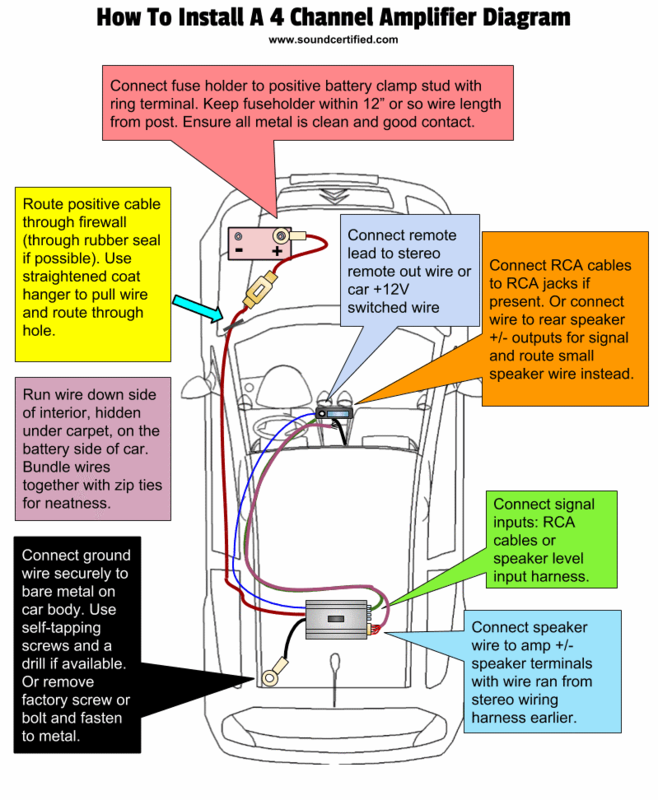 If I do it your way and run from amp to behind head unit and use the factory wire from behind head unit to speakers will I lose any sound quality or power? I’m not sure what size the factory speaker wire is running throughout the vehicle. Recently installed a pioneer avh 211ex as well as all new speakers to a 4 channel amp wired with rca cables. We’ve tried everything and can’t get any sound to the speakers anything we’re missing? If you need more info let me know. All help is appreciated. AVH 211EX -> [RCA cables] -> Amp -> speakers (directly wired). If that’s not the case please let me know. I would verify the amp is working ok by using a test speaker wired to it directly and also connect your phone or other audio source directly with a headphone to RCA cable adapter. That way you can be 100% the amplifier is fine. If that works, then connect the AVH211EX to another amp or home stereo (outside the vehicle) to verify the RCA signals are working. They should be, as that’s not a problem I’ve seen much. Also, be sure to make sure that audio outputs aren’t disabled in the menu settings. Check your manual. 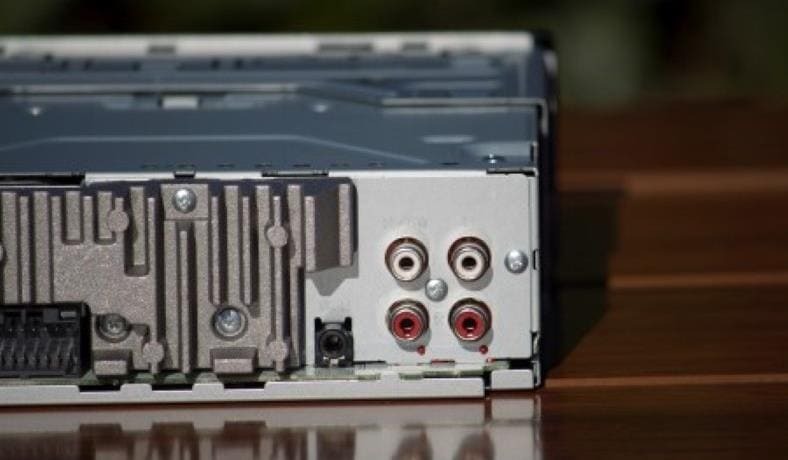 Some head units offer the option to turn off the speaker outputs or RCA outputs. Are you using the speaker outputs? What we would normally do in a case like this is do a “bench test”: Remove the stereo and amp and test each one separately with a separate ratio or speaker we know for sure works to see which one isn’t working as expected. Without more details those are my best suggestions. Hello, Chris! Thanks for visiting the site & for the comment. Usually factory speaker wiring is around 18-20 gauge or so, which is fine for this kind of system. Yep, you can just run the speaker wire from the amp to the factory wiring. Ideally you can use a harness adapter to avoid having to cut the factory wiring. In this case you won’t lose any sound quality or power. It’s when you get to much higher power ranges that it makes a difference. That looks like some nice items you’ve picked up so I’m sure you’ll enjoy them. One comment I do have is that the 4 gauge power supply is larger than you need for that amp. If it’s not already installed and you haven’t run the wire yet, I’d use 8 gauge. That’s a bit easier to deal with especially when going through the firewall. Also, 4 ga. wire may not fit well on the power terminals on that amp. I have a mrv-v500 5 channel amp hooked up and 2 subs. I’m using a jl fix 86 processor because I did not want to change my head unit so I kept it factory. If I want to change my head unit, using the rca out puts from head unit to amp is my best choose right? Also I’m guessing I would have to remove the processor since it would be a aftermarket head unit. Hello, Julio! Glad to hear from you. I’m glad you like the content. Yes, if you change the head unit, using the RCA connections would deliver the best sound. However, the good news is that you won’t need to get rid of the FiX-86. It will accept a wide range of input levels and should work with RCA (line-level) inputs. However, you’ll need to use some RCA to bare wire adapters or cut cables to connect it, according to what I saw in the owner’s manual. There should be some items you can find that will do the trick. If you can’t find any let me know and I’ll look one up for you. Also, that would be good if you can show me some items for RCA to bare wire. Hey, yep I found them! FYI, the reason I’m suggesting these instead of simply cutting & stripping regular RCA cables is because that wire is very small and a pain to deal with. 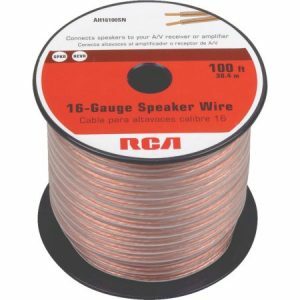 These will make your installation much easier and are reasonably priced, too: RCA female to speaker wire adapters. Hi, i have pair of focal 165 vrs (60rms) running through hertz he-4 (75watts rms x 4 at 4 ohm) and the speakers sounds bad no bass. I have connected them on channel A and have sub on channel b bridged. Any idea why they dont sound good. What possible i have done wrong ? Btw i run 16g wire from amp to front hu wiring harness then using factory wiring. (Audi a3 8p). Thanks! Hi Pawel. You don’t mention what stereo you’re using and a few other details like that, so I’ll answer the best I can based on what you wrote. 1. Are you using the high-pass crossover function on the front speakers? If so, switch it off and see the result. 2. How did the factory speakers sound? Was there good bass for those? If yes, that leads me to believe it’s either installation related or the speakers won’t perform well in the doors as they are now. 3. You need to be 100% sure that there’s nothing in the factory speaker wiring that could be causing an issue. To verify this, temporarily use some speaker wire to bypass the factory wiring you’re currently using. If that changes the sound, there’s likely some type of crossover component in the factory system causing the problem. Unfortunately, not all speakers will sound good in all car doors. If there’s not a decent enclosure (if there are bad air leaks, etc) poor bass happens. In that case it’s installation-related and you’ll need to try to seal off the doors where the speakers are installed. Don’t worry about the speaker wiring size – that’s not going to cause poor bass response.